Thanks for visiting the Frank & Kraft website. We’re happy that you have taken the time to learn about our firm and the Indianapolis community we serve. Our city is one of the jewels of the Midwest, and as the capital of the state of Indiana, it is a thriving center of commerce and culture. We have seven distinct cultural districts in Indianapolis, and Monument Circle stands proudly in the center of our city to honor those who have served our country. When you conduct business during our current era, you can feel a sense of distance, even if you are going shopping in your own neighborhood right here in Indianapolis. There are all of the big-box stores, and you have vast shopping centers and strip malls that are full of national chain stores and restaurants. Of course, there is the Internet as well. A lot of people purchase things online (including boilerplate estate planning documents), and this creates an added layer of distance. Because of this dynamic, community is something that you have to strive for proactively. 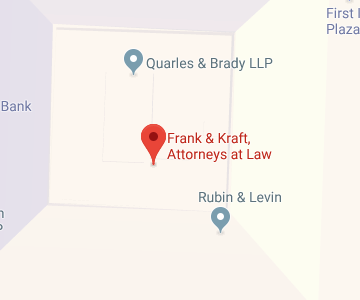 Here at Frank & Kraft, we have a full understanding of the value of community, and we take our commitment to the people of Indianapolis very seriously. Paul Kraft is one of our founding attorneys, and he is our senior Principal. His Indiana connection runs deep as a graduate of Indiana University School of Law, and he also completed his undergraduate work in Bloomington. He co-founded the Indiana Network of Estate Planning Professionals, and is a member of the Indianapolis Bar Association. On a personal level, Mr. Kraft is extraordinarily community-minded. He is very active in the rehabilitation of buildings that are of historical significance downtown, and he is President of the Jewish Federation of Greater Indianapolis. Marvin Frank is the other co-founder of our firm. He is also a graduate of Indiana University School of Law, and he is deeply steeped in tax law. Mr. Frank has been firmly embedded in the Indianapolis community for many years, and the is one of the founders of the Big Brothers of Greater Indianapolis. As estate planning and elder law attorneys, we are speaking to clients about very intimate family and financial matters. This is a huge responsibility both personally and professionally. These people are our neighbors, and in many cases, they become our friends. We do everything possible to make our clients completely comfortable, and we sincerely want to help them preserve their legacies for the benefit of their families. To us, our clients are not numbers; they are members of our community, and we share the same spaces, and we experience many of the same things. There is no one universal estate plan that is right for every family. Each situation is unique, and we approach our interactions with our clients with this in mind. A last will can be appropriate when very simple circumstances exist, but in many if not most cases, a trust of some kind can be a better choice. There are trusts that can be used to protect assets, and there are also trusts that can reduce estate tax exposure. It is possible to use a trust to protect a spendthrift heir, and certain trusts are used to provide for people with special needs who are relying on government benefits. Long-term care costs are part of the equation as well. Medicare does not pay for living assistance, and most seniors will require help with their day-to-day needs eventually. Medicaid will pay for long-term care, but there are income and asset limits, because it is a need-based program. We help clients implement strategies that lead to Medicaid eligibility. Make the Local Connection with an Indianapolis Estate Planning Attorney! If you are a resident of the greater Indianapolis area, you have found a down to earth, passionate, and community-minded estate planning law firm. We offer free consultations, and our firm would be glad to help you put a plan in place if you are not currently prepared. Plus, if you have an estate plan that you created years ago, we can review it with you and help you make any changes that may be necessary. To set the wheels in motion, give us a call at (317) 684-1100 or send us a quick message through our contact page.